If you're having trouble with the steps in this article, additional assistance is available via CloudTech, our premium services division. Our expert engineers can assist you with third-party CMS configuration to keep things running smoothly. For more information on what CloudTech can do for you, please click here. 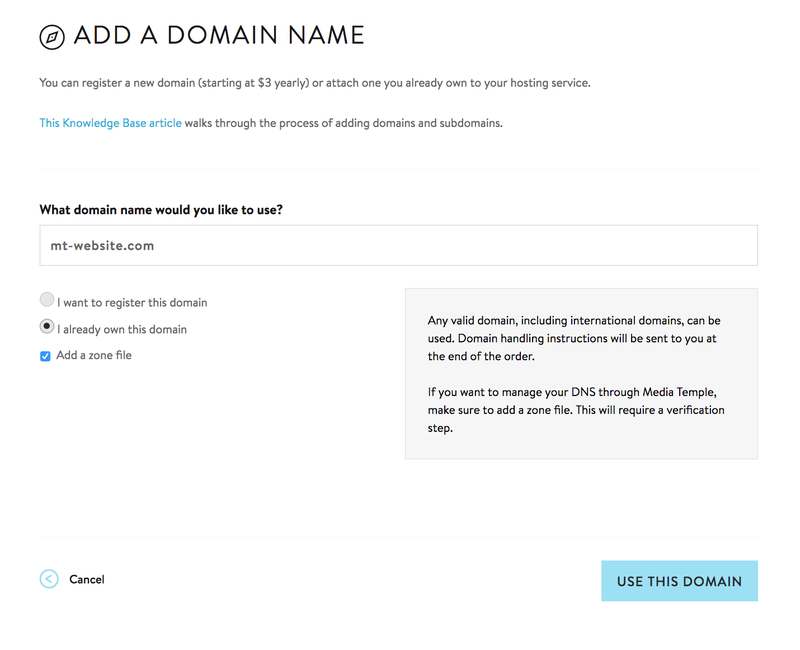 This article will show you how to change the domain name for a WordPress site on your GridDV server. 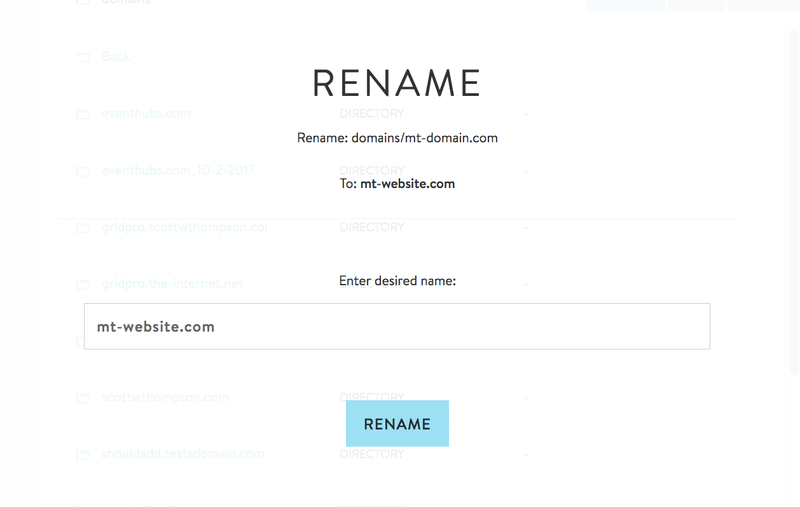 In this example, we will make these changes to reflect a name change from mt-domain.com to mt-website.com. However, this can be accomplished between any domain or subdomain hosted on your GridDV server, on the same webspace or subscription. The steps in this article will NOT move your site files for you! You will need to do this manually. These instructions are designed to help you update WordPress to reflect the correct domain name after you have moved your files. We advise keeping a copy of your WordPress installation folders while you are making this switch, so you don't accidentally lock yourself out of WordPress while attempting to make any changes. WordPress installed on your domain. Both the current and new domain are added as a primary or alternate domains to your Grid server. If you require instructions on adding a domain to your server, you may feel free to review our article here. Open a web browser, and log into your WordPress Dashboard. 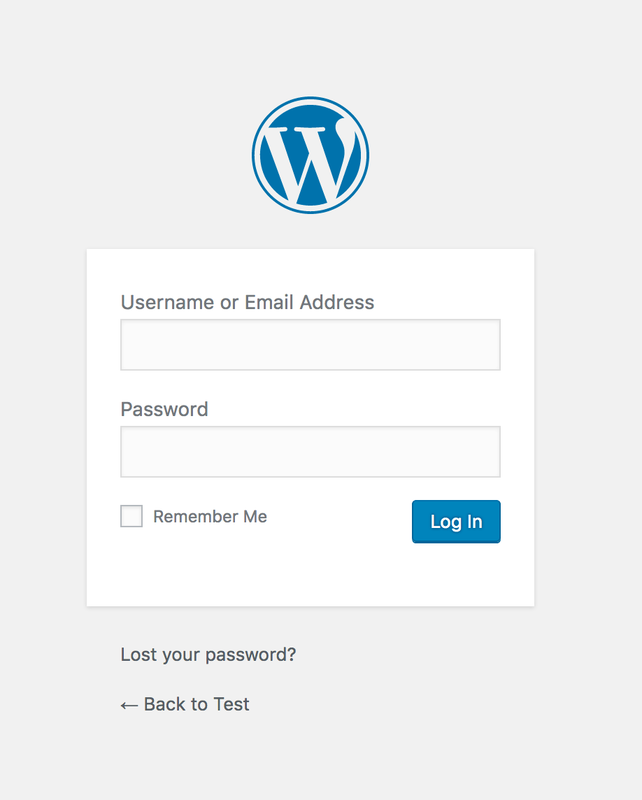 (typically the WordPress Dashboard login is accessible at the URL example.com/wp-admin). Once you have logged in, click on Settings. Then click General. Once in the General Settings, locate the WordPress Address (URL) and Site Address (URL). Update both sections to the new domain name. Then scroll to the bottom of the General Settings menu and click Save Changes. Now you will want to update your website's folder/directory. This can be done through File Manager, FTP, or SSH. In this example, we will use the File Manager built-in with your Grid. Navigate to the File Manager. Then click on the /domains folder. 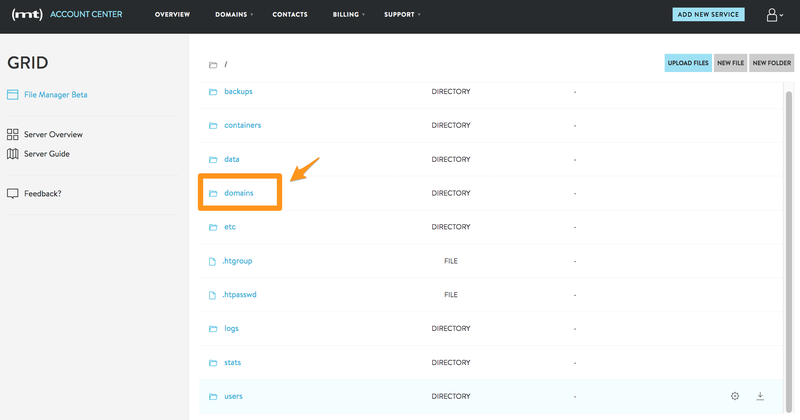 Once in the /domains folder, locate the folder that has your website's name. Click on the "gear" icon. A pop-up menu will appear to your right. Then click Edit Name. For legacy versions (such as the (gs) Grid Service or Grid Lite), the icon may appear as a "pencil/paper" icon instead of a "gear". In this example, we are attempting to change the name of the folder /mt-domain.com to /mt-website.com. However, suppose there is already a folder named /mt-website.com in here. We would need to rename or delete the pre-existing /mt-website.com folder first. Otherwise when you try to rename /mt-domain.com to /mt-website.com it will read as a duplicate folder and not work properly. Input the desired domain name. (do NOT include http, https, or www in this step). That's it! Your domain name should be changed. You can open a new browser window and try visiting your site with the new URL. 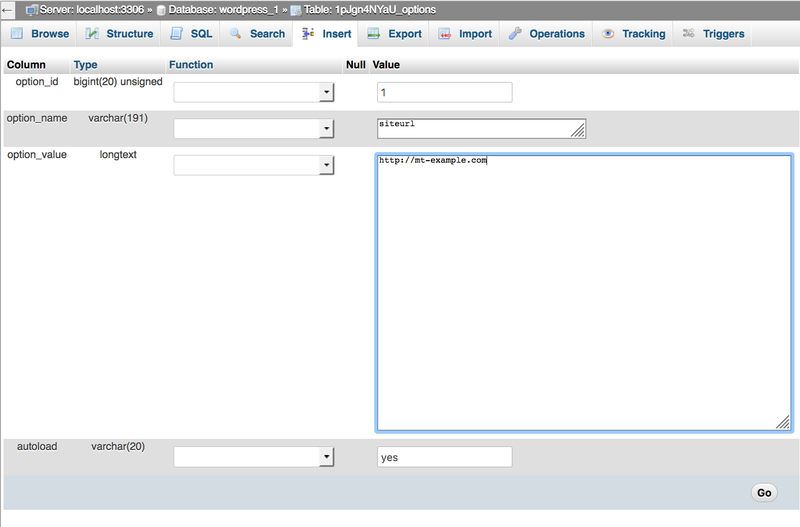 If you need to review your database credentials, those can be accessed within the wp-config.php file. 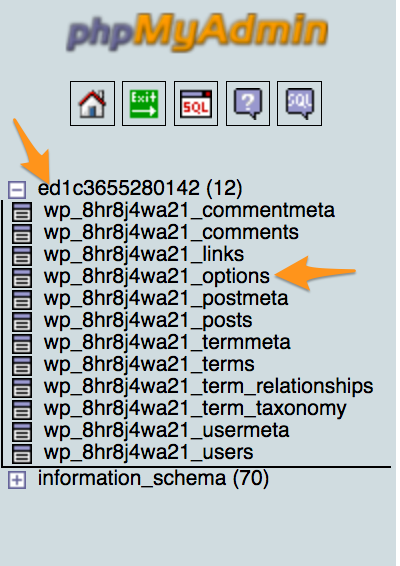 The typical path for this file would be /domains/example.com/html/wp-config.php. 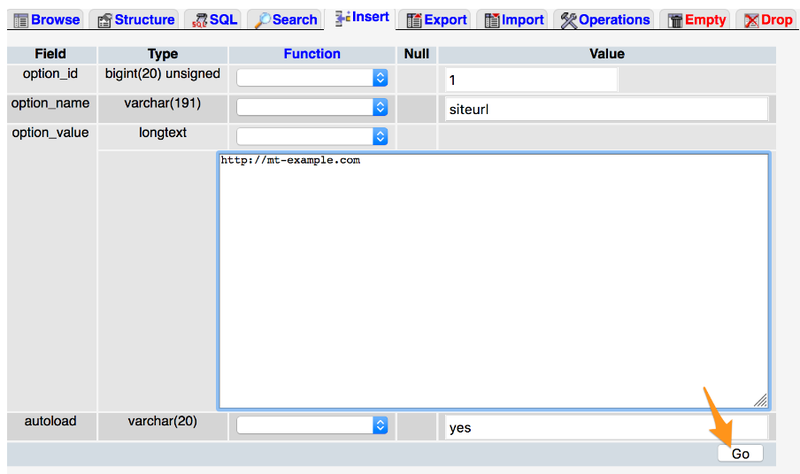 Once in phpMyAdmin, locate and click on your database located in the left menu bar. Ensure you are in the Browse section. Locate the siteurl and home sections. To edit these you can click on the Pencil/Edit icon next to each table. If you've installed your WordPress using Managed Apps, you might only see the siteurl option. This is normal, and you can edit just the siteurl section. Insert your new domain name. Then select "Go". Do this for both the siteurl and home table, if applicable. Now you will want to update your website's folder/directory. This can be done through the File Manager, FTP, or SSH. For more detailed instructions on the process, you can refer to Method 1 - Steps 5-8. Both the current and new domain are added as a primary or alternate domains to your Grid server. If you require instructions on adding a domain to your server, you may feel free to view a Community article on the process here. 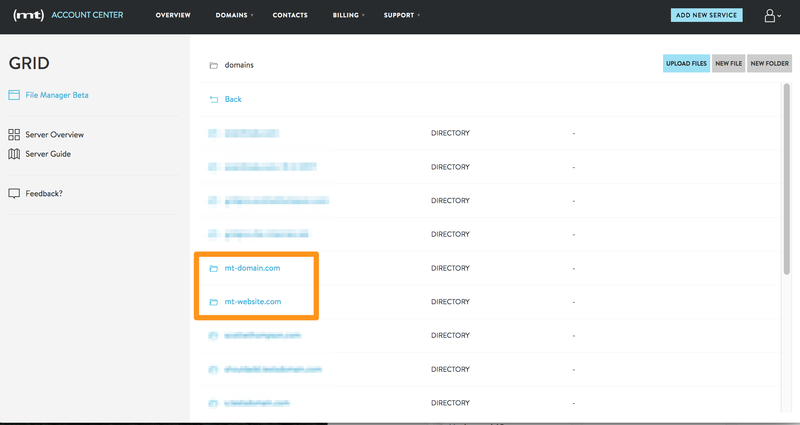 Make sure the new domain name A-records point to your DV server. Once you have logged in, click on Settings. Then click on General. Update these to the new domain name. Then scroll to the bottom of the General Settings menu and click Save Changes. (If you wish you can add https or www in this step). 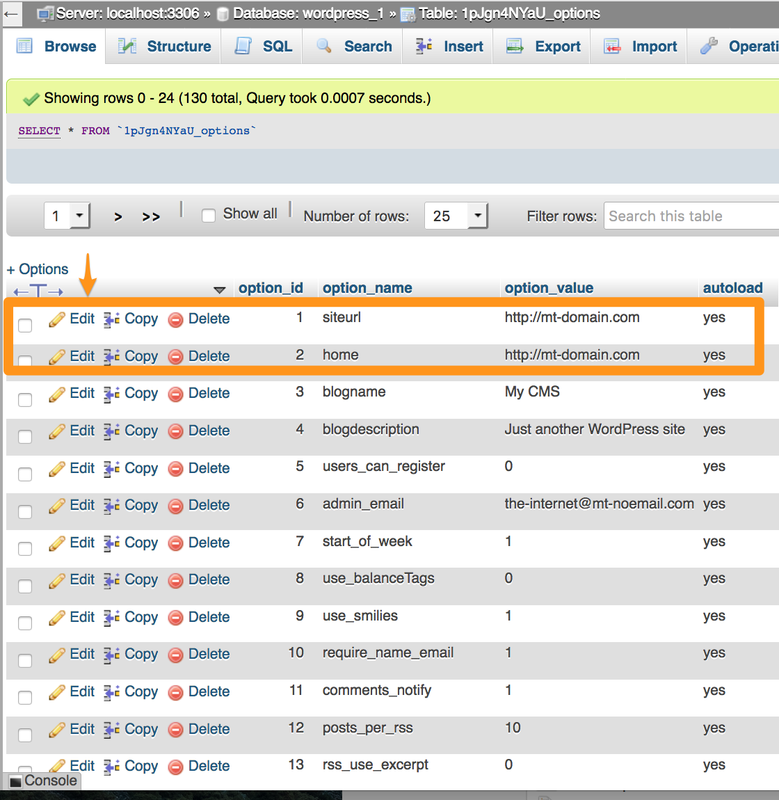 If you need to review your database credentials, those can be accessed within the wp-config.php file. Insert your new domain name. Then select "Go". Do this for both the siteurl and home table. The WordPress servers has an option in the Account Center that provides even non-technical customers the ability to edit their URL. Log into your (mt) Media Temple Account Center. 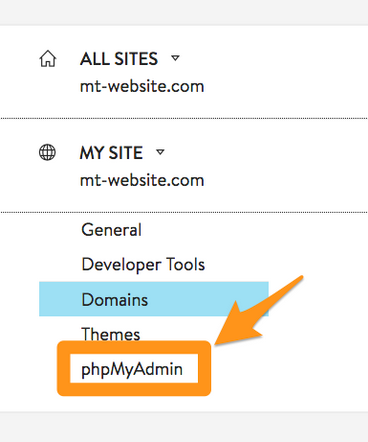 Click on the blue Admin button next to your WordPress Server. Move your cursor over the site slot that you wish to edit. Then click on Manage Site. 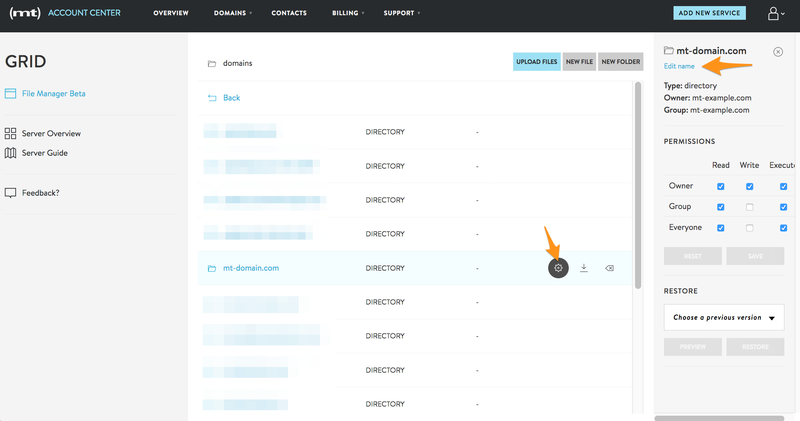 On the left side of your WordPress control panel, click on Domains. If you haven't added the desired domain name yet, click on Add Domain. Enter the desired domain name (it is not necessary to add www). If you need to register your domain name, you can also do so at this step. If you've already registered the domain either at (mt) Media Temple or with a third-party registrar, you can intead select "I already own this domain. Then select Use This Domain. You will be prompted to add the domain to your server/site. Select your WordPress server, then select the site slot you wish to add it to. Once the domain is added successfully, you will see it listed in your Domains page. Wait about 5 minutes. Then select the drop down menu to change your Primary Domain name to the new domain name. Wait another 5-10 minutes, and that's it! Your website should begin to show the new domain name. If you experience any delays in this change, you can attempt to clear your WordPress hosting cache. 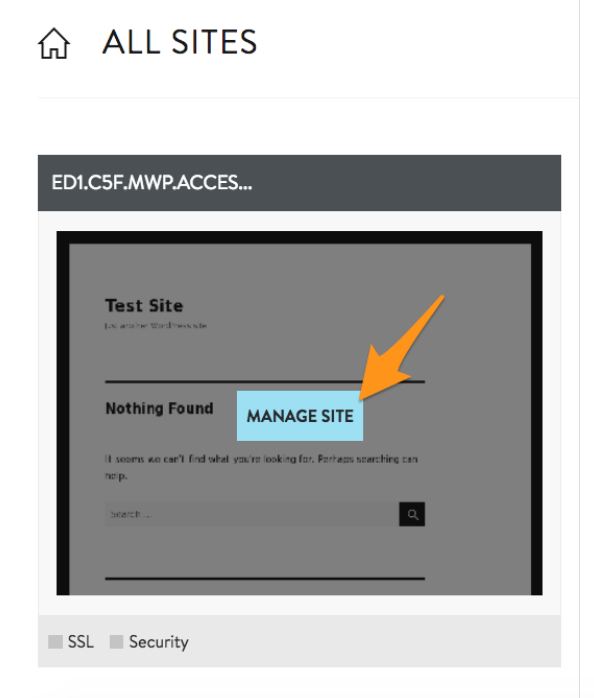 If you've changed the primary domain, cleared the WordPress Hosting Cache, and are still not seeing the desired username, you can check the database to ensure the URL is properly set there. Look on the left had side of the screen. Click on your database. 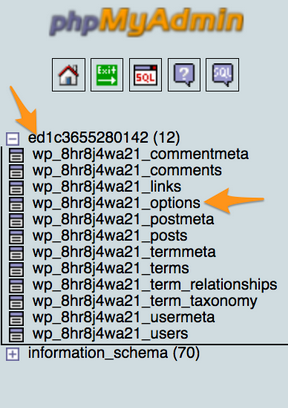 Then click wp_options. Check the "home" and "siteurl" sections. If they are not set to the appropriate domain name, click on the Pencil icons. Insert the desired domain name. Then select Go. Wait 5-10 minutes, and that's it! Your domain should begin to show the new domain name. If you experience any delays in the change, you can attempt to clear your WordPress hosting cache.